Designed for the 1932 Chapel renovation; Reproduced 1968 after the 1957 fire. Lamb design or data borrowed, sent 1961. Quotations from spirituals, including "Go Down Moses (Let My People Go," "Rise Up Shepherds," "Swing Low, Sweet Chariot" and "Roll, Jordan, Roll." 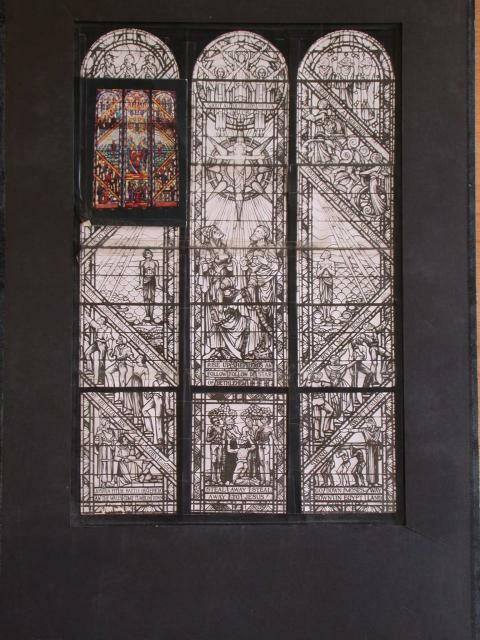 Verso: small black and white photocopy of same or similar recto image, here with caption "The Chancel Window, Tuskegee Institute -- Tuskegee, Alabama, Executed by the J & R. Lamb Studios, New York." Architect of current building: Paul Rudolph, with John Welch and Louis Fry, both former faculty members. Barea Lamb Seeley recalls university choir performing the depicted spitiruals as window design unveiled in New York.